Posted: Thursday, January 12, 2017. 8:36 am CST. Posted: Thursday, January 12, 2017. 8:25 a.m. CST. 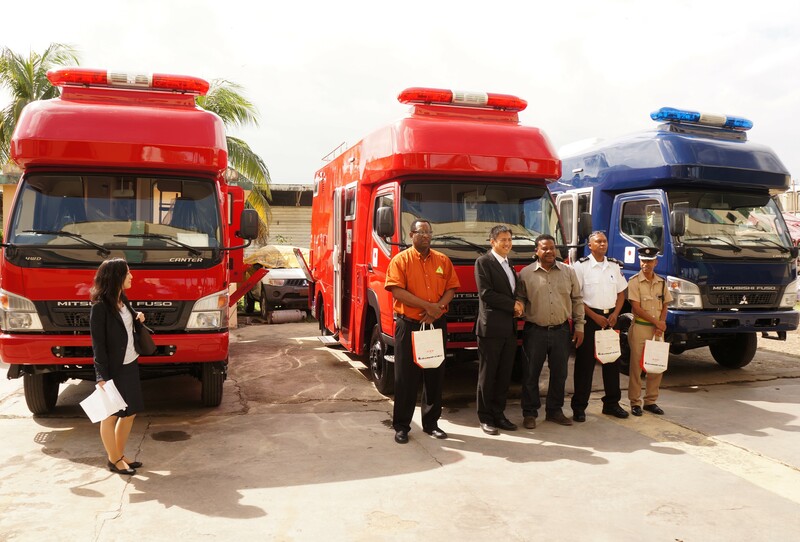 By BBN Staff: The Government of Belize yesterday received three command vehicles donated by the Government of Japan, through their Non-Project Grant for Industrial Products.The three vehicles will be utilized by the Police Department, Belize National Fire Service and the National Emergency Management Organization (NEMO), as on-site command centres during emergency situations. The Japanese delegation, headed by Parliamentary Vice-Minister for Foreign Affairs Shunsuke Takei, arrived on January 9. Vice-Minister Takei met with several ministers of Government including the Deputy Prime Minister Patrick Faber; Minister for Economic Development, Trade, Investment and Commerce Erwin Contreras; and acting Minister of Foreign Affairs Godwin Hulse. During the meetings, the Japanese delegation received an update on the state of the Belize-Guatemala Territorial Dispute, among other bilateral matters of interest. Minister Takei expressed support for the two parties’ decision to go to the International Court of Justice (ICJ). Japan is a founding member of the Group of Friends of the Belize-Guatemala Peaceful Resolution Process. The handing-over ceremony was the final event marking the end of the Japanese delegation’s visit. Belize and Japan enjoy over 30 years of cordial diplomatic relations including political, economic, and cooperation interests.